"We picked Kelly & Troy because they have their finger on the Asheville mid century modern market pulse, a pleasure to work with, good peoples, a clean and professional transaction. We will use them to sell our home in the future. Cheers!" "Troy and Kelly helped our family of six relocate from Raleigh to Asheville in the early summer of 2017. Being 4 hours away with four kids to either drag with us to Asheville or leave with friends in Raleigh, made Troy and Kelly's search job extra difficult and their days with us extra long! Unbelievably, we only travelled to Asheville 3 times before landing the perfect house. They know Asheville well and were able to take our "must have's" mixed with our, "would really like's" and found quite a few matches for us on every visit. They took care of every aspect of the home search and purchase so that we could focus on selling our house in another city. I don't know what we would have done without their calm, efficient house hunting skills and thier mantra of, "we'll find your house, it's out there waiting". They were just perfect for us. Plus, later in the year they went on to recommend the best contractor too -". I fully recommend Modern Asheville Real Estate." "Troy and Kelly were present, communicated well, and were extraordinarily helpful to us as first-time home buyers. They listened to our requirements and helped us to find the unique and perfect home for us. We felt comfortable with their explanation of the process at each step and were very pleased with the extra effort that they each expended on our behalf. I can wholeheartedly recommend them. " "For first time home buyers, this process could have been very intimidating, especially since we had a very specific type of house with mountain views in mind. But Troy & Kelly were wonderfully helpful & the process was streamlined in ways that I'm sure any client would appreciate. We're so happy to have found the perfect home for us & that we chose Modern Asheville to assist us in all the steps from finding it to owning it! We highly recommend this professional team!" "I first met Kelly Erin-Spinney and Troy Winterrowd of Modern Asheville Real Estate three years ago. I found them to be very engaging and knowledgable about the Asheville real estate market. I knew I would be looking to buy larger home in three to five years and quickly realized they were the agents I wanted to work with when the time came. I was not disappointed. I am a very organized and detail-oriented person ~ Kelly and Troy are also. I felt comfortable every step of the way during my home purchasing experience. I never felt pressured or neglected. Once I found a listing that I was interested in they handled the negotiation smoothly and efficiently. They were in daily contact with me. This will be my seventh home and I have never had such professional and caring agents. Now we are in the process of selling my current location in Asheville. It has been a pleasure working with the Modern Asheville team and I highly recommend them!" "Troy & Kelly were fantastic partners in the sale of our house! We were out of town owners and we completely trusted their counsel. They navigated through the entire process professionally and thoughtfully and were extremely responsive. They clearly have a thorough understanding of the local market and have all the solid contacts necessary to make things happen when needed. We would have no hesitation to recommend Troy and Kelly and use them again if the need arises." "As first time home buyers, we were grateful to work with Modern Asheville. Kelly and Troy walked us through each step. Their guidance, professionalism and knowledge was unsurpassed. We can not recommend them enough. " "Working with Kelly and Troy has been the most efficient relationship that I have ever experienced in real estate - this after having bought and sold homes in 7 different states. From the very beginning and throughout the entire life cycle of selling my home, they demonstrated initiative, attention to detail, timely follow up, problem solving and accessibility. It has been a professional partnership that produced results...without any surprises. After selling my home, there was no hesitation in engaging Modern Asheville to become my agent as I examined future properties to purchase. " "We actually sought out Modern AVL, as fans of their blog. When we finished our whole home renovation in '14, selling was the furthest thing from our minds. With the recent low inventory of homes for sale in the area, we thought it was worth checking out. Kelly & Troy did a tremendous job marketing our home! Most importantly, they were extremely receptive for our desire to maintain privacy & respected our other wants/needs during the process. Although the sale of our home is a little bittersweet, part of the advantage of working with Modern Asheville is that they're bringing 'like-minded' buyers to the table - they really foster a community committed to mid-century/modern design principles & a mutual respect for our environment. It's much easier knowing the home you invested so much time, energy & passion into will be equally cherished. Kelly & Troy's partnership works well - nice having a team on your side!!" "Kelly helped us find our first home in Asheville. She took time to learn what we wanted and helped us find it. When we were ready to sell, she helped us do that as well as find another. Not only does she know what appeals to us, she knows what appeals to particular buyers. It has been a great relationship." "Kelly and Troy from Modern Asheville were amazing to work with during our first time home buying process! Kelly was so knowledgeable and helpful when we would have questions and she was always quick to show us homes we had serious interest in. Searching and purchasing our first home has always been a dream of ours and we couldn't have imagined going through this process with anyone other than Modern Asheville. We HIGHLY recommend them if you are looking to move to the Asheville area :)"
"Kelly is a real go getter. Love her commitment to getting her client what they want. I felt like she really heard me and was working for my benefit. I recommend her often to friends and family." "Kelly and Troy had an immediate intuitive sense for what we were looking for and helped us identify those types of houses without distraction. They work so seamlessly as a team--Troy's ability to creatively visualize the possibility for a house and its surrounds; Kelly's extraordinary efficiency and list of contacts. We found a home quickly and were able to see its possibilities. We were also able to close quickly. We are comfortable having relied on their knowledge, and they were awesome to work with. We have now chosen to work with them on a second project. " "I have worked with Kelly and Troy 3 times while in Asheville. Every single experience was top-notch. They KNOW this market -- mid-century, modern, cutting edge--all of it. They love what they are doing, and you can feel it. They are strategic and never once wasted my time. Everything they showed me was on the money. Kelly had the vision to see past obstacles and offered solutions if needed, and it was never in an effort to sell me on something. I always felt that Kelly and Troy were on my side, had my best interests at heart, and that I was THE most important client they had. They have class and smarts and made selling AND buying easier. I’ve been on both sides of that table, and let’s face it, those can be stressful times. But I never felt stressed or pressured. They take care of all the angles. I will be forever grateful for their expertise and sincerity. You will not find anyone who works harder for you, or makes it as fun. Look no further." "Outstanding every step of the way! The Modern Asheville team helped make finding and purchasing our new home in Asheville an absolutely positive experience. Living eleven hours away was certainly a challenge to us when we started seriously looking for a new home. Kelly and Troy helped bridge the gap by being extremely responsive to calls and inquiries made at all times of the day and evening and looking at houses before we spent the time and money to travel to Asheville. We were very active buyers and felt we understood the Asheville market yet Kelly and Troy were imperative to the process. Helping us navigate the details and pointing out particulars that would have been overlooked without their knowledge. They are professional, informed, friendly and meticulous. We highly recommend Modern Asheville. " "What a great experience. I can't say enough good things about Kelly, Troy and the Modern Asheville team, but let me try. Right from the beginning we hit it off and they understood what we were looking for. Their advice throughout the process was invaluable - coaching us on the Asheville market every step of the way. When we finally found just the right place, everything else went extremely smoothly - from contract handling, to inspections (we were out of town) to the final closing. We couldn't have been happier. I recommend Kelly, Troy and Modern Asheville without reservation. Be grateful you found them." "Kelly did an outstanding job of finding us our first house in Asheville. We are originally from Ohio and didn't reply know how the market worked, what neighborhoods/areas were desirable, etc. Kelly was very informative and upfront with all of these details, and was able to find us the right house at the right price point in mater of 3 days. She was also very diligent on our behalf when it cam to the offer, letting us know that there ewer multiple offers on the house and we had one shot to make our best offer. It was great advice because we ended up with the exact house we wanted while still being within our price point. Even after the offer was accepted, Kelly was extremely helpful taking care of the things her in NC while we were back in Ohio preparing for our move. My wife and I would recommend Kelly and Modern Asheville to any and all that ask. We are so grateful to have worked with them, Kelly in particular, and will definitely do so in the future." "Troy and Kelly work very well together and are professional, knowledgeable, friendly and thorough and their follow up is second to none. I had no clue what it takes to buy a home and they walked me through every step, answering ever question, every phone call and responding to every email quickly. I actually felt that I was their ONLY client! They found me my dream home, arranged a meeting with a lender and had all the connections necessary for me to complete the purchase. Troy traveled over an hour each way on many occasions to meet with inspectors, exterminators and other workers. They are positive, upbeat and will make you feel like old friends immediately. They explained every step of the process, gave recommendations and suggestions on how to get through the myriad of paperwork easily and really knew their stuff. I can’t imagine you will find more dedicated, professional, responsive and friendly brokers anywhere in western NC. Needless to say, I would highly recommend them." "Matt and I looked in the Asheville area for over three years for a home. Once we found the exact home we wanted, we called Kelly and Troy. The got us into the house immediately and helped us negotiate a fabulous price. They were well informed, helpful, and conscientious that whole process and got us to close on our house in less than 30 days! We highly recommend them to anyone who wants to get a great house in beautiful Western North Carolina!" "Kelly is a great negotiator and represented our interests well during the search for, and purchase of, our retirement property. We were somewhat challenging clients because we live out of state and much of the time had to deal with her remotely. When we finally met face-to-face we found that Kelly is even better to deal with in person--she's very personable and had recommendations for us that showed she really understood our needs. She was a great go-between and really helped keep the purchase on track when some unexpected complications popped up. We're looking forward to working with her again on our next property purchase!" 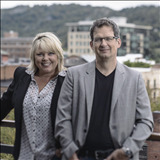 "My husband and I were grateful to find two like-minded spirits in Modern Asheville agents Kelly and Troy. While we are both big fans of homes in the Mid-Century Modern style, when we started looking for a cabin in the country, we decided to expand our search so that we could have the place on the water we'd always dreamed about. Within a very short period of time, Kelly & Troy came up with a well thought out group of homes for us to look at--they never wasted our time with homes they knew would not meet our criteria. Our opinions and desires were respected and met with completely by this dynamic duo---seriously---they both went above and beyond all of our expectations in a real estate agent. As a result of all of their hard work, we found exactly the place we wanted, in the price range and the location that we wanted and in the time frame we wanted! We would recommend working with Modern Asheville Real Estate for any and all of your property needs--no matter the style!" "We were first time home buyers and Kelly &Troy made the process smooth, easy and fun. They understood exactly what we were looking for in our new home and made it happen. We couldn't be happier with our experience with Modern Asheville and highly recommend them. " "Troy and Kelly worked with me to find my home in Asheville. I am from out of state which could have made that process more of a challenge. Troy was recommended to me. From the time I contacted Troy to the time I closed on my house, both him and Kelly were extremely helpful, prfofessional and customer service oriented. They did an excellent job of narrowing properties timely and organizing showings very quickly. They went above and beyond the call of duty to assist me in getting everything accomplished with my logistal situation. I would recommend them to anyone in your search real estate. They were the BEST!!!!" "After living in Massachusetts over 35 years, the thought of possibly moving to another state was a big step. Asheville was on our radar as a retirement possibility. We followed the Modern Asheville blog and decided to reach out to Troy and Kelly to help find the right “fit” for us. What stood out was their patience. They sent us updates on the market between our visits and stayed in touch while we anticipated our retirement. When we were finally ready to make the leap, Kelly and Troy knew exactly the style home that would make the move easy, exciting, and fun. Because of their knowledge and connections with the modern movement in Asheville, they found us our mid-century modern house before it hit the MLS. As soon as we walked in we knew we found home. They nailed it! We highly recommend this team. They know their market, they listen and respond quickly with any concerns or questions. We thoroughly enjoyed getting to know them in the process. Kelly and Troy...the best!" "After consulting with Kelly and Troy, I realized that it was a seller's market for downtown Asheville condos. Due to the uniqueness of my condo, I knew that targeting the right potential buyers was the key. Once again I reached out to Kelly and Troy to market the unit. They found an investor who was eager to buy and I was under contract before I ever expected. They know the market and work their butts off. I highly recommend their services." "Troy and Kelly of Modern Asheville were great realtors to work with. They anticipated my questions and concerns and were very thorough in our initial discussions of the sale of my home. They were also very responsive and when I contacted them and they got back to me quickly each time. They did very thorough market research and set the price a tan amount where it sold quickly and I made a good profit. Kelly and Troy had strong leads that resulted in the house selling before it was officially listed – they also publicized my estate sale on Modern Asheville. Both were very nice to work with. Troy met me to the closing when I signed all the papers, personally gave me my check and gave me a very thoughtful and generous closing gift. I couldn’t have asked for a smoother and less painful home sale. " "We were looking to buy a house in Asheville for our retirement. Some of our family lives near and we had graduated from NC State so it was good to think about moving back to N.C. I first noticed Kelly and Troy when I stumbled upon the Modern Asheville blog. I can only imagine that working with an out-of-state client may have been more difficult for them but I never saw it. They were exceptional in the service they provided and it was a mere two months before we had a beautiful single level ranch under contract. I can't say anything more than everything went perfectly." "Because they were professional in all aspects. And they were sharp, they listened, knew Asheville and helped us find the perfect place at a great price when not much was in inventory. We had used 2 other agents from another realty agency for 18 months prior. Kelly and Troy took care of us in about 4 weeks. Recommended without hesitancy. " "Forget recommendations … I'm offering a commendation for the Kelly/Troy team. My husband and Ihad been searching for our dream escape from Houston's summer sizzle for two years. Within three months of signing on with this Daring Duo we found an awesome property. Both Kelly and Troy worked diligently to make the deal happen. They went the extra mile that is often needed when clients live very far away. I wouldn't work with any other agents." "As owners of an authentic, mid-century house, identifying the right market was paramount to meeting the asking price for our unique home. We turned to Modern Asheville because they have established themselves as experts in modern and contemporary design and architecture. Their marketing strategy immediately introduced our home to sophisticated buyers producing astonishing fast results. Kelly and Troy respected our privacy while marketing the house and took care of any unforeseen issues that arose. The transition from sellers to buyers was almost effortless. I highly recommend this very professional and knowledgeable team of real estate consultants. " "We really appreciated the sound advice and great attention to detail concerning all phases of the advertising, pricing and marketing of our property in Asheville. And it was that same combination of advice and attention to detail that was so helpful during the subsequent negotiation period. " "This is a great team and exactly the kind of attention to detail and extra mile service that I was hoping to find with so many choices out there. Troy/Kelly are right on time with all communications, keep you in the loop 24/7. Fun, kind and efficient attitude and ethics throughout the process. House was under contract in just weeks. I would use them again!" "Working with Modern Asheville was one of the best realtor experiences I have ever had. Troy and Kelly were smart and strategic, thoughtful, and offered us suggestions and support at every turn. I really felt like they had our best interests at heart. They know this market inside and out. Their passion and tirelss commitment made the whole listing process a seamless, positive experience."